Samsung's Gear Fit—a pretty lookin' smartwatch-fitness tracker hybrid—has finally gotten its price. It'll be available for a cool $200 and will be showing up sometime in April. 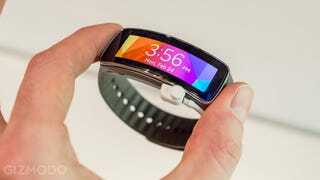 Its bigger more traditional smartwatch brother the Gear 2, will be one hundred dollars pricier at $300—the same launch price as its lackluster predecessor, the Galaxy Gear. Both of the new wearables have ditched Android to instead run on Samsung's own open-source operating system Tizen, which offers the growing hardware giant an opportunity to push back a bit against Google. That said, the funcationality is going to be basically the same. The other thing that's (unfortunately) the same is that both of these new smart-wrist-thingies will only work with Samsung devices running Android 4.3 and above. It's better than the tiny collection of two compatible phones the original Galaxy Gear launched with, but it's still a deal-breaker for anyone who doesn't want to dabble with a Samsung phone. And considering that the Gear Fit actually looks pretty good and has a semi-reasonable price, that's more of a shame than ever.